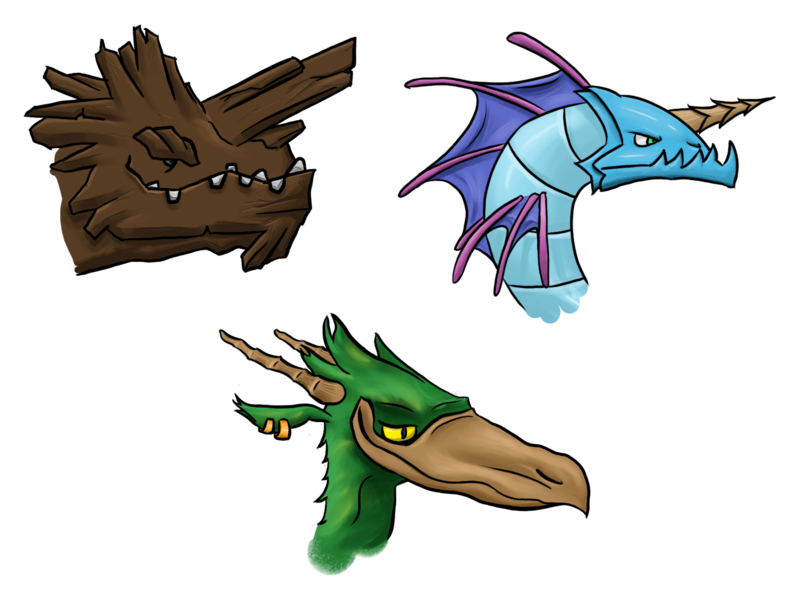 I want to increase my rendering skills, so I've rendered a few dragons one of my friends sketched for a game we're making. I'll be posting more here as we go along and I always appreciate tips! The I who drew the sketches has a semi-cartoony style and I didn't really look at references haha, but it turned out pretty okay I think :). My own style goes more to realistic-anime-ish, a good inspiration there would be Final Fantasy for instance. I'll try to do some studies of that sometime soon :D.
I would suggest the same as Joris said, but just as a warning if you ever decide on realistic style, then don't use photobashing while you're still learning. Leave it for when you can render pretty much everything to the level and style you want. Another thing that I would suggest is starting render practice from primitives such as cube, sphere, cylinder, cone, etc. The problem with the image that you upload is that the forms feel pretty flat. There's no volume (I'm not sure if I'm saying it correct). Here's where a good understanding of the primitives will do you much good. A good way to show form with minimal effort is using hard shadows. It goes even with the cel shaded style you have here or anime style you are after. Just make the light part as is, but the shadow part few values darker. Throw some minimal reflective light and done.. The tricky part is to figure out what direction the light is coming from to show the forms as best as possible. Good luck! I've tried some stuff with the shadows, started with the stone one, then the bird, then the water one. I forgot a few shadows here and there and I increased the amounts of dark and brightness levels so there's darker colors and brighter colors. It worked out pretty well I think! Inspired by Nexcomix's piece "Undead Priest", I've drawn this.